Based on their success in the desert, the Willys Jeeps were used in many purposes by various organizations in Europe as well. The 1st Airborne Division (UK) used them as scout vehicles, including an attempt to land them at Arnhem in 1944. But they were used in many other scouting and raiding roles as well. This kit is the “Euro” version of the vehicle and compliments the SAS “Desert Raider” versions with all of the modifications made for use in Europe. It comes with standardized fittings for extra fuel tanks and “flimsy” cans plus a variety of armament options. They have also included the 2nd SAS Regiment figure set (No. 6199) from 2008 to give some figures to complement the vehicle, but none are designed to fit inside it. As it has corrected parts as well as some nice new ones it now comes on nine sprues but the body and frame are removed from their sprues and bagged separately in the box. The body is slide molded with all but the grille and rear plate. There are some serious injection pin marks on the bottom of the body and under the fenders, but other than the fender wells I don’t think most modelers will bother with removing them. The model comes with a cut-out grille but then emphasizes a new correct molded full grille which comes with the new set of universal tires. The Mark IA eyeball tells me they are virtually identical other than the missing bars, so apparently DML has corrected the original grille with incorrect spacing and location of the blackout lights. As this is the “Euro” version it comes with a backing plate of armored louvers, but these are a single piece. With appropriate painting and finishing techniques it should look the part, however. A “blackout” disk is included from brass for the right side headlight to match British practice. This kit comes with extended range fuel tanks on the tops of the rear fender wells as well as four “flimsy” fuel cans on the rear plate. Etched brass tie-down straps are included for all of these cans to attach them to the vehicle. Two bracket carriers mount one on each front fender as well. This vehicle offers a wide choice of armament as it comes with no less than eight Vicker K machine guns and a pair of M2 air-cooled .50 calibers as well. Armored windscreens are included in either clear styrene or sold grey, so the modeler has a choice on what to do with them. A total of 10 disk magazines is included for the K guns and the box art and directions show no less than five of them mounted on the representative vehicle. The seats have separate pads and backs, and the controls are very complete, to include pedals. The figures are of four men in “para” suits and berets, so can be finished as either SAS or paratroopers at the modeler’s discretion. Each one comes in six parts per the normal breakdown with additional Commonwealth kit for completion. Ron Volstad’s artwork playfully shows two Paras and an SAS man in a jeep surprising a pair of Germans in an Opel Blitz! There are two finishing options: both are for SAS vehicles in Northwest Europe 1945. One is standard green/olive drab and the other is green with black “Mickey Mouse” camouflage. A sheet of Cartograf decals provides for instruments and a “number jungle” for the census number. The figures are given blue/grey/white painting instructions and the box art provides better information on their finishing. 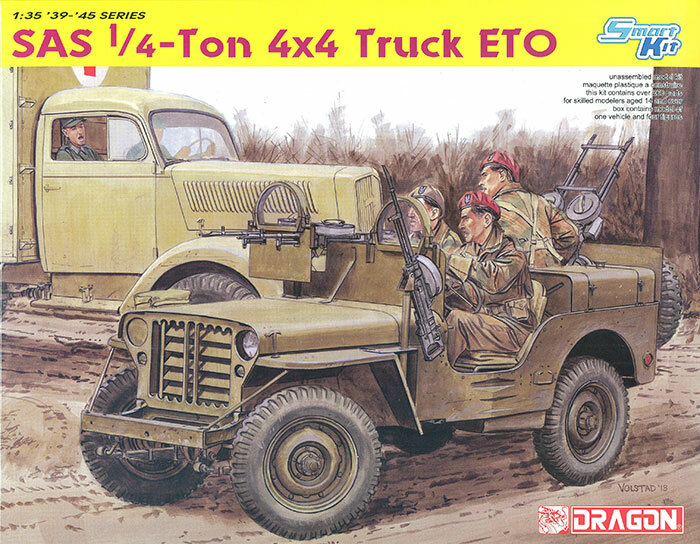 Overall this is a nice kit and probably can be used in a number of ways - I unfortunately do not have the specific changes made to the 1st Airborne scout jeeps used or lost at Arnhem.